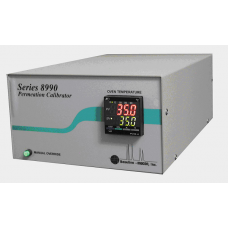 The Baseline Series 8990 Permeation Calibrator allows a user to generate custom gas calibration standards. Using certified permeation devices and precision flow rates a user can generate a range of accurate gas standards. This ability relieves the user from purchasing multiple expensive bottled gasses, allows the replacement and addition of individual components on the fly and eliminates the fear of accidentally running the afore mentioned gas cylinder out. The instrument provides a constant temperature chamber with temperature control up to 122 ºF (50ºC) and stability within ±0.09 ºF (0.05ºC). The diluent gas is pre-heated prior to introduction into the permeation chamber to provide maximum temperature control. The carrier gas flow rate is controllable between 20-200 ml/min. An additional flow controller is provided for dilution and can be controlled from 100-1000 ml/min. It can be switched from standby mode (only carrier gas flowing) to calibration mode (carrier gas and dilution gas flowing) locally via a front panel switch or remotely with the Series 8900 GC.